These are pics from the show that Little Miss T was in on Oct 3rd. I will try and put on video if it lets me of her performance too. 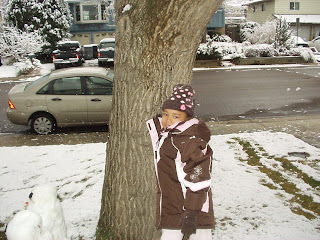 She did this with her older sister T. They had a blast! Little Miss T in her First Performance! Little Miss T had her first performance on April 28th at her school. She was specially picked to be in this performance with a few other kids from the school. She has worked hard and did a fantastic job. Just putting a little snippet as to what she did. She enjoyed it emmensley. She also had a new hairdo as you can tell in the video. Her father cut and straighted her hair about a month ago. She seems to like it, but upset that her hair was cut shorter than she would have liked. It was down to the middle of her back, and now is cut to her shoulders. 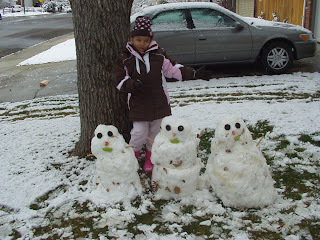 We finally had our first REAL snow here that started yesterday, and finished this morning, and we had fun building snowmen, a Mama, Papa and kid. 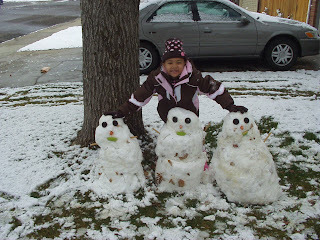 Taps had fun making them, and then we had a snowball fight, which she won... she is much quicker than her momma. Ha Ha! 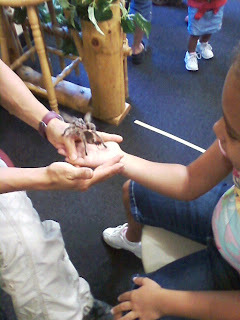 Little Miss Taps has been busy... She went on a field trip and got to hold a Tarantula and learned about Bugs and insects for one of their school projects. 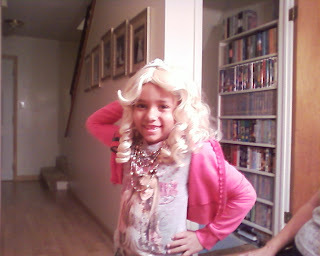 For Halloween T'phy was Ms. Hannah Montana, and had fun going Trick or Treating. TAPS newest feat is learning how to ride a two wheeler as well. Hopefully we will have more better weather so she can get really good. She is very excited and doesn't feel so left out with her friends and cousins that already know how to ride a two wheeler. This is Little Miss TAPS room makeover. We did over labor day weekend while she was with her dad and his family. TAPS was real exited - we even made a sign sayin "Welcome to your NEW room Makeover!!" Then she looked at us, and luckily, her Auntie B. Got it all on film, with squeals and all. I think it turned out pretty cute myself. She LOVES her new bed too, and has been sleepin in her own room now due to the new upgraded room. For those who didn't know, the color before was a boyish blue -- and has been wanting a "PINK GIRLY" room for awhile now. She is excited about her photo wall too. She has all photos of those she doesn't get to see very often on her wall -- and is always adding to it. Little Miss Taps is losing it! Ha Ha. Just her teeth that is for now... Thought i would share. She looks so CUTE with her teeth out... and hearing her talk is just as cute! She can do some pretty neat tricks with a straw with her teeth out...and a few other neat little tricks she has come up with. She couldn't wait til christmas to see that good ol song "All i want for christmas is my two front teeth! " 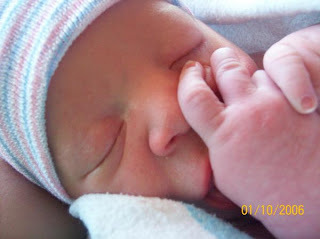 Taps is an Auntie again! 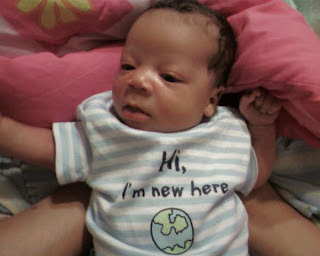 Taps is the proud Aunt of a Lil Nephew Sir Dre. 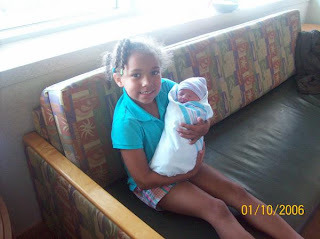 He was born a month ago, and you can see how proud and excited she is of being an Aunty! 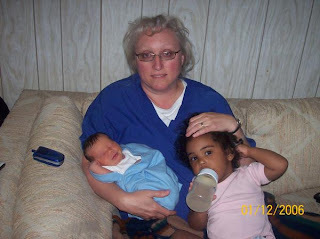 She has a niece already too, and in the photo is her step mom, and her nephew and neice.